From zero to maximum playing fun in a few seconds. This fast-paced Kullerbü Playful Set from HABA makes it possible. Set up the archways, get the speedster with momentum motor into position, and the driving pleasure can begin in the children's room. Where will the racetrack run to? From the starting gate, underneath the desk chair, past the rug to the finish line or along somewhere else? Children's imagination and creativity know no bounds, particularly as the Kullerbü elements can be flexibly integrated with each other. 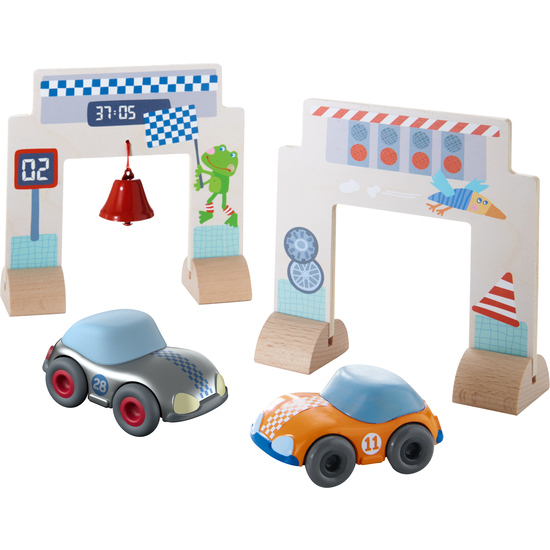 Contents: 1 starting gate, 1 finish line with little bell, 1 orange speedster, 1 silver speedster. Material: beech, plywood, plastic. Dimensions: orange and silver speedsters L 9 x W 5.7 cm, Ø balls 4.6 cm. Age: from 2 years.